Drift HD Ghost Helmet Camera – Use With Smart Phone APP! Drift Innovation has become known as the best award-winning company that specializes in producing world-class action cameras. They have now launched their new Drift HD Ghost helmet camera that is loaded with features and has become the most intuitive action camera yet! The biggest enhancement with the Drift HD ghost is the addition of the App (for iPhone and coming soon to Android) which lets you control your camera and share it via Wi-fi to other phones and devices. Watch the video to see exactly how the new smart phone app works to use with Drift HD Ghost. Right now it’s only available for the iPhone but soon to be released on Android. Note: The app is designed for use with only the Drift HD Ghost. It won’t work with Drift HD or other Drift Innovation cameras. All-In-One Beauty with New Features! The Drift HD Ghost has all the features you want built-in such as HD video and 11 megapixel still shots. Rotatable lens (which is also removable/replaceable), and built-in LCD screen for quick video replay and frame alignment. New features include a 2-way LED remote with an off/on indicator (very handy as the previous remotes had no indicator at all! ), new Flashback continuous loop mode as well as video tagging which lets you constantly record but only save when you want to. There is a ton more to this camera which makes it one of the best all-in-one camera on the market. 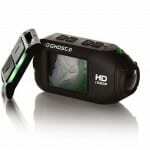 There are many cameras that have aftermarket accessories in order to function and there’s nothing else on the market like the Drift HD Ghost camcorder. This camera comes with everything that any sports enthusiast would need to help capture any professional shot needed without the blur and all with high-quality pictures. This is an easy to use camera and is easy to set up and to navigate around. This allows users to begin recording from the moment they take it out of the box. This camera has become the only camcorder to have an on and off remote control that has LED lights on the strap that you wear on your wrist. The lights are strategically placed and allow users to know the mode using a color code system that indicate photo, video, photoburst, timelapse, and more. Functionality is also streamlined and functional allowing users to switch between modes and to be able to stop and start recording. For those who are into fast action sports, this feature you’ll never miss another crash, dunk, miracle pass or action moment ever again. This is a highly unique feature which other cameras are yet to include. The Drift Ghost camera has the ability to save an event as much as 5 minutes after it has taken place when it’s in video tag and loop mode. This is going to allow you to record footage allowing you to relive all of your favorite moments and to dwell on them. The screen is also covered with a scratch-proof cover which allows scratches to be repelled. With the Drift Ghost camera, there is an upgraded lens design which consists of 7 elements. This allows your pictures to become clearer and ensures pure performance regardless of being on top of a cliff or on top of a mountain. This allows you to get clear and vibrant pictures as well as video that is in HD quality. Like any professional action camera these days, there are several HD resolutions to choose from that range from 1080p, 960p, 720p, and WVGA. You’ll be able to simultaneously take still shots (up to 11 megapixels) without cutting into the video allowing you to capture every moment. This camera offers a highly long battery life and allows you to record 3 hours of time for each charge. The battery is rechargeable and is made of lithium-ion. The PowerStation that this camera features allows for unique placement in the middle of the camcorder which helps maximize the battery life. If you’re looking for a high quality camera that offers advanced features this is the one to choose. On top of it all, it’s waterproof allowing you to go up to 9 feet in water which is great for those who enjoy snorkeling and being in the water. 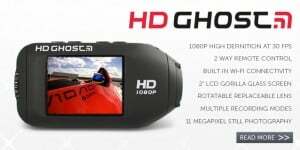 The price of the Drift HD Ghost is not cheap but competitively priced for an action camera that packs all the latest and even unique features. The regular retail price is US $399 (same as the GoPro 3 Black and Contour + 2) but I would go with the Drift Ghost simply because of the built-in screen, remote and now app which lets you control your camera… Plus it just looks cool! Ordering online can save you hassles.. you can order from the comfort of your home – no wasting time fighting for a car park, no crowds of people to deal with. Plus when you order online, you get a better price! Thanks for reading and enjoy your new Drift HD Ghost. This was my review, I hope it was helpful to give you more information about this new top of the line action camera.